You may recall that I'm trying to shed my rep as a plant killer. So this weekend I went to the nursery and picked out a couple of innocent, unsuspecting boxwoods for my front stoop.﻿ Here they are, blissfully unaware that they are standing where so many of their fellow foliage have met an untimely death. Well, maybe they look more like bonsai trees than topiaries, but I'm hoping as they grow I'll be able to round them out some more. I was trying to be conservative, so I didn't kill them on day one. And, don't worry... they won't be housed in those plastic black tubs for much longer. I found a pair of planters that I'm considering getting. I need to make a decision soon and get the boxwoods transplanted to new containers. Otherwise, they're likely to kick the bucket and I'll never change my reputation. Love those square containers. Nice and big and chunky. Hopefully they will survive. I need to buy some plants, too. From one plant killer to another I can understand the pain! I planted twelve new plants today and I am just waiting to see which one dies first. The planters look perfect for your boxwoods. 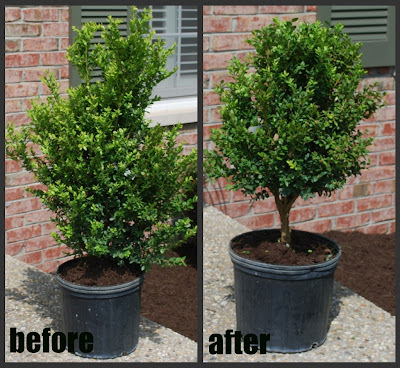 They will do fine, boxwoods are a hardy bunch. 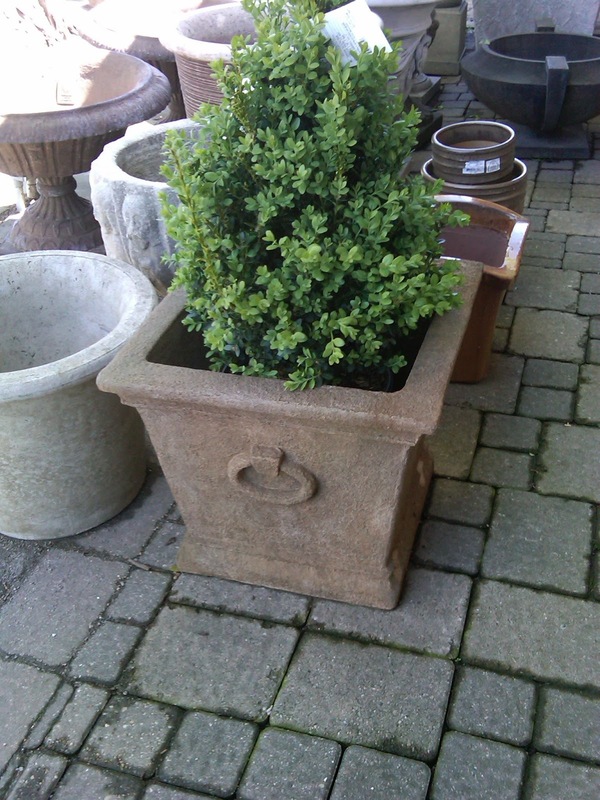 I love the square containers, they will make such a statement at your entrance. Looks like what I'll be doing this week! Can't wait! 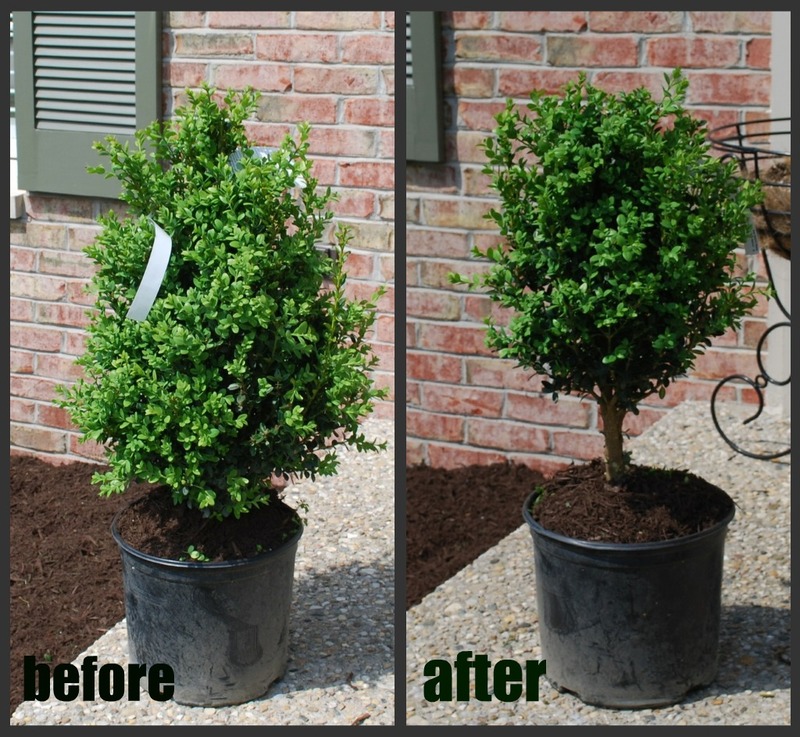 Love the containers and the trim you gave the boxwood! Girl wait til you see I have a post coming up this week on killing something. I am bad! 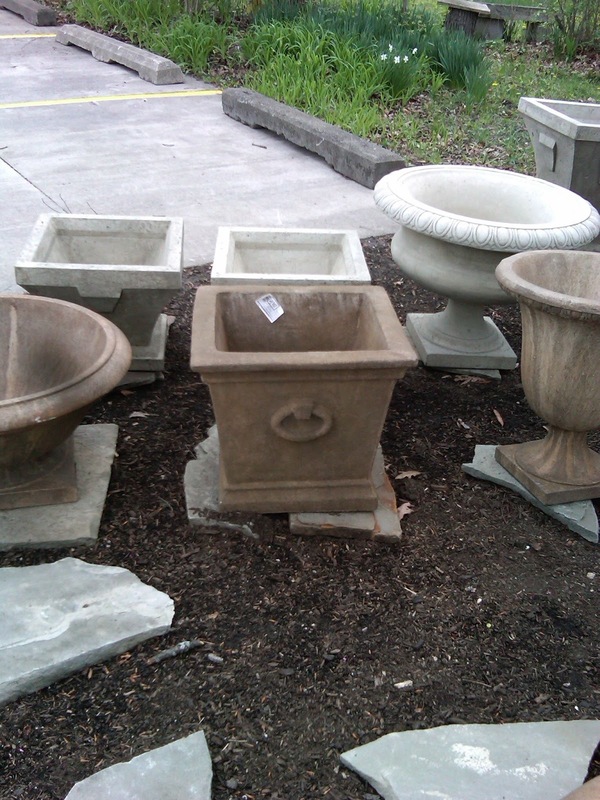 Your plant and planters look great. Thanks for sharing with my newbie party. 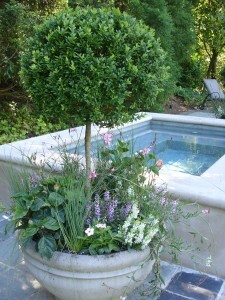 I adore boxwood and love how you are training your "to standard"/ topiary. I bought some to do that with and forgot to check the trunks. They had multi trunks, so I just left them bushy. lol You've inspired me to get two more and try again. LOVE the square planter you chose. Love boxwood! The square containers are fabulous looking and I can see it now...can't wait to see the finished product, I just know its going to be fabulous! Okay. So. I am not a plant killer..... So allow me to give you some advice. 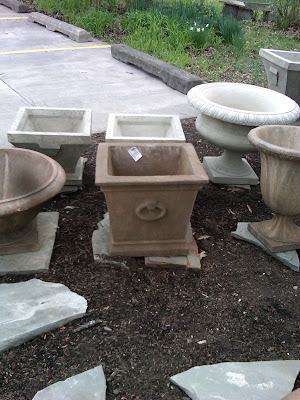 First, the planters that you are considering are too small. You need more room in order to have some extra soil in the pot for your box woods to use as they grow. Without extra soil, they will become root bound and you will be watering them twice a day to keep them alive! Second, make sure that you do water them everyday for the first 10 days, especially if you are not getting a good soaking rain. Third. I would have told you not to prune them, as you have already done, because it could stress the plant. You usually should wait until you see a plant established to prune it back. You are probably still okay, because you cut back very little, but just keep that in mind going forward. Hope you remember to post pictures in 6 months of these beautiful plants. The key always is to WATER and don't forget them. They are your new friends! Love your blog! I am a new follower -- visiting from Debbiedoos. You did a great job pruning your boxwood. Love the new shape and your collection of planters are tdf. Good luck ! Love the square planters! Good luck with the pruning, I am still wanted in Tennessee for the murder of a lovely rosemary topiary. Hello! Found your blog through Debbie. I am now a follower. You did a great job trimming your plants. The planters are perfect but you will probably have to take them out in a year or so.